And so the adventure begins. After nearly a year of planning, we are off. The Vietnam Airlines flight was half full, providing the luxury of a vacant seat in each of our rows. The friendly service that greeted us at check-in continued onboard as we flew the nine hours north to Hanoi. Upon takeoff, the windows of the new Boeing 787-9 windows automatically darkened—a first for me—changing the experience as you look out through the heavily shaded glass. I photographed this just as we were departing the Australian continent, yet all you can see is an inky blue visage. 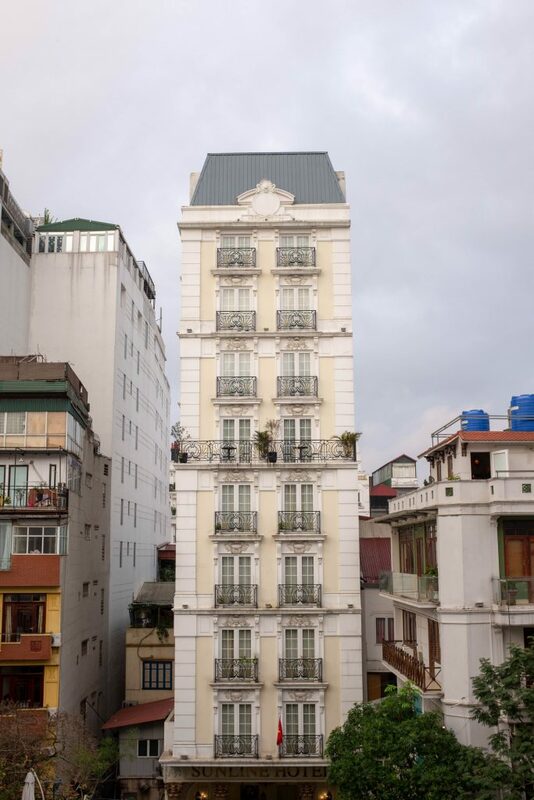 We arrived late at night and went straight to the Gondola Hotel in Hanoi’s Old Quarter. On the way in from the airport, it was interesting to note the local driving customs. 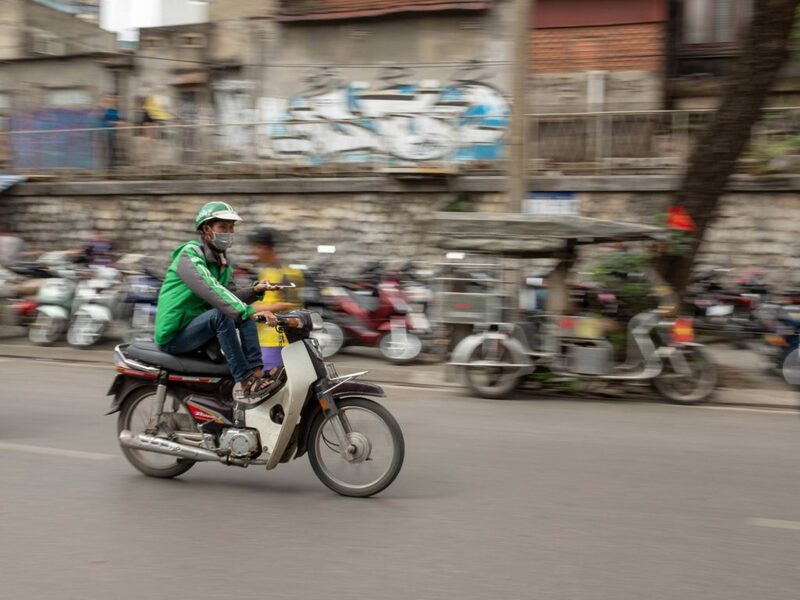 Similar to a school of fish, each driver/scooter rider merged with the beep of the horn into the oncoming traffic. This would be important for us in the coming days when we picked up our motorcycles for seven days of riding in the mountains. 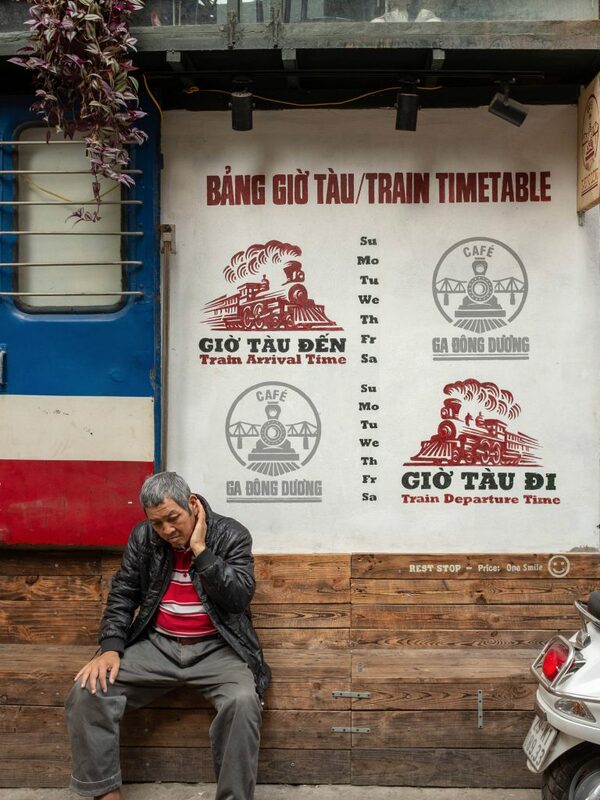 The next morning I awoke having slept well and looked forward to our first day in Hanoi. Walking out of the Gondola Hotel, it immediately strikes me that there is a vibrancy to the city, one typical of those that are rising in prosperity. 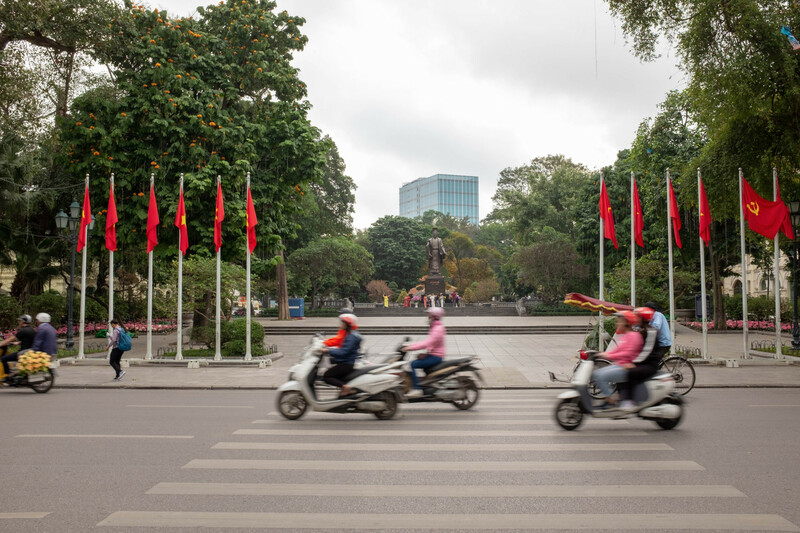 The weather was cool as we wandered around the Hoan Kiem Lake in the Old Quarter taking in the mix of French Colonial and Asian architecutural styles. 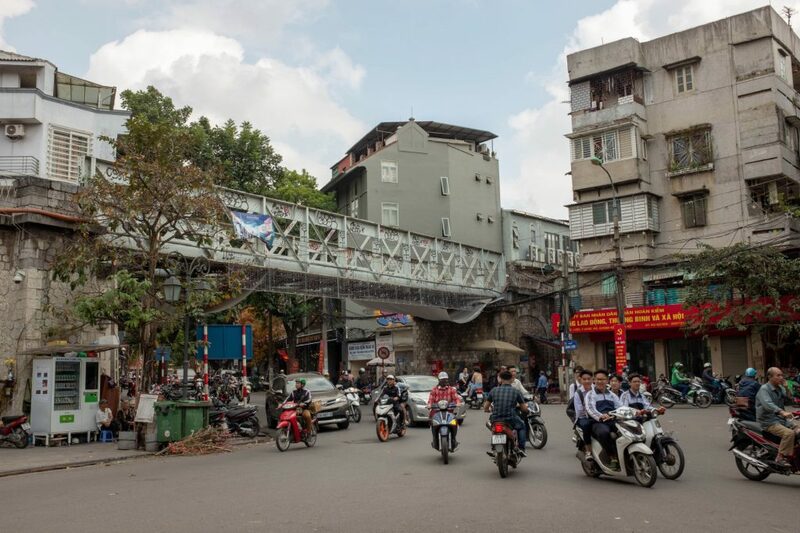 This first required navigating a series of road crossings; the successful navigation of which is key to enjoying Hanoi. Tip; walk boldly out into the traffic and it seems to flow around you. The traffic is one of the eye-opening aspects of the way this city works. Residents make it work by using common sense, riding their scooters or walking wherever there is space. This is so different from what we have in Australia where rules have been created for practically every circumstance. 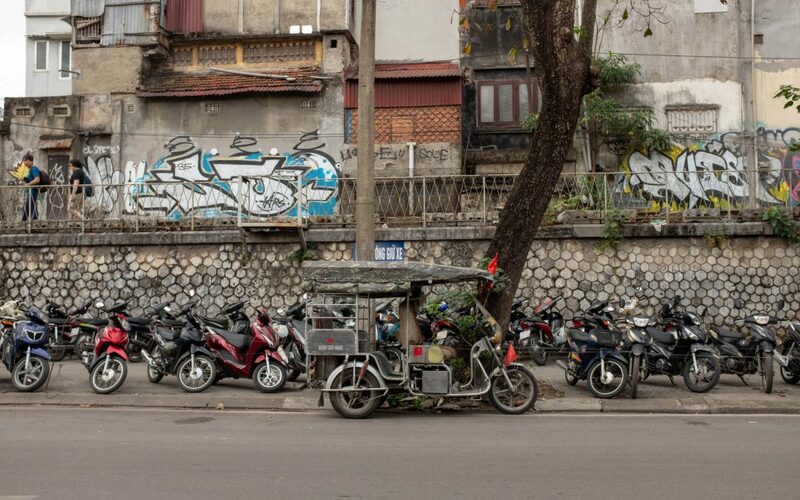 In Hanoi, people create their own rules to survive in the city. After circumnavigating the lake, the crew—I will refer to our group of five as the ‘crew’ for simplicity—were keen to try a Vietnamese coffee—strong black coffee sweetened with condensed milk—in a traditional coffee shop seated on the footpath. After an eye-wateringly sweet coffee, we made a pact to seek out better options as the trip progressed. 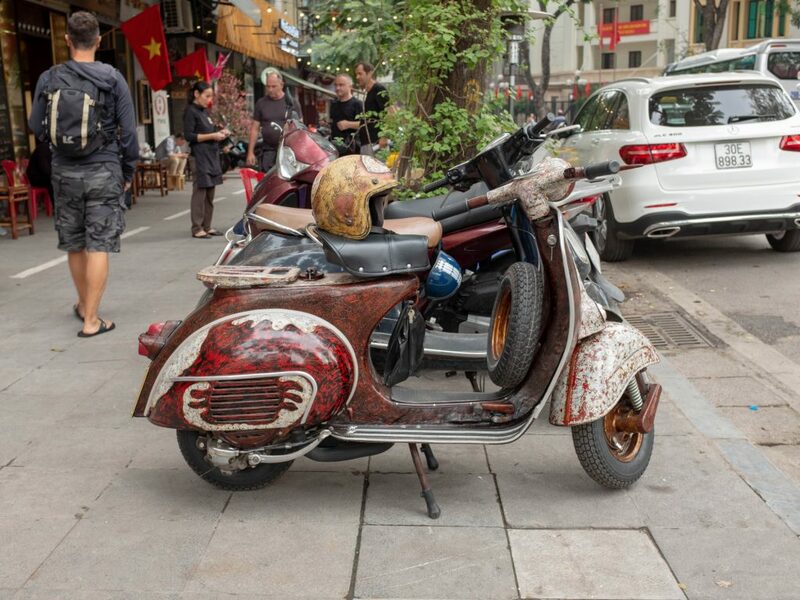 Photo note: the unusually painted scooter pictured was parked out the front of this cafe. 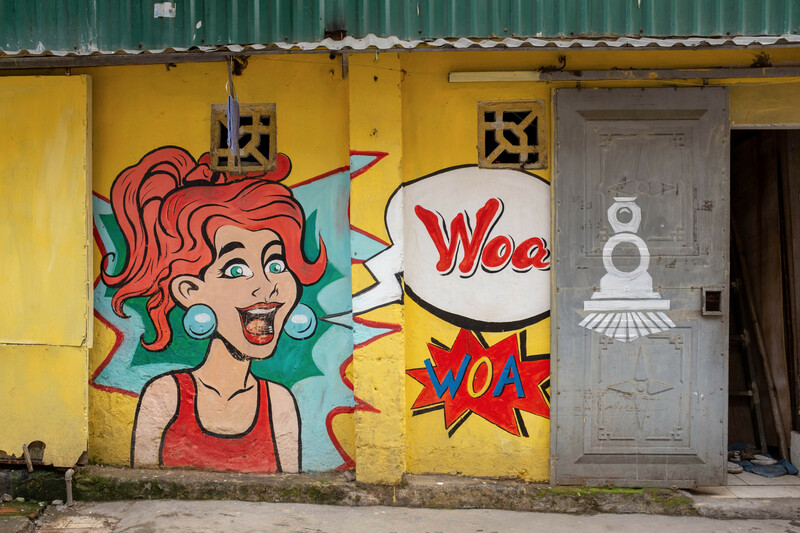 As we walked, it became clear that there is a visual texture to the city. Various materials have been used to build ranging from concrete to stone to wood, with both rough and smooth finishes. 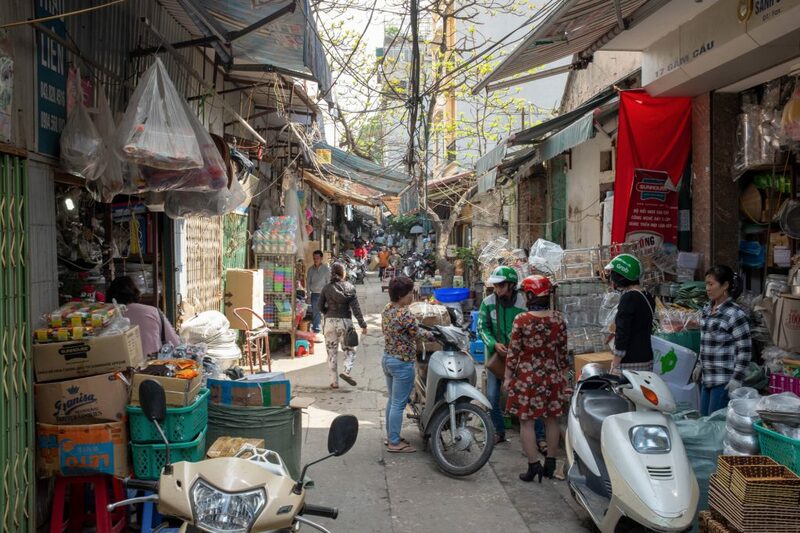 This variety is also reflected in the people on the streets as both the old life (primarily agricultural in nature) butts up against the new life of modern Vietnam. At a shop around the corner from the Gondola Hotel, they sell prints featuring traditionally dressed people (soldiers, rice paddy workers, government officials, etc.) on skateboards. This is an example of local artists playing with this juxtaposition found within the city; I made a note to come back and purchase a print. 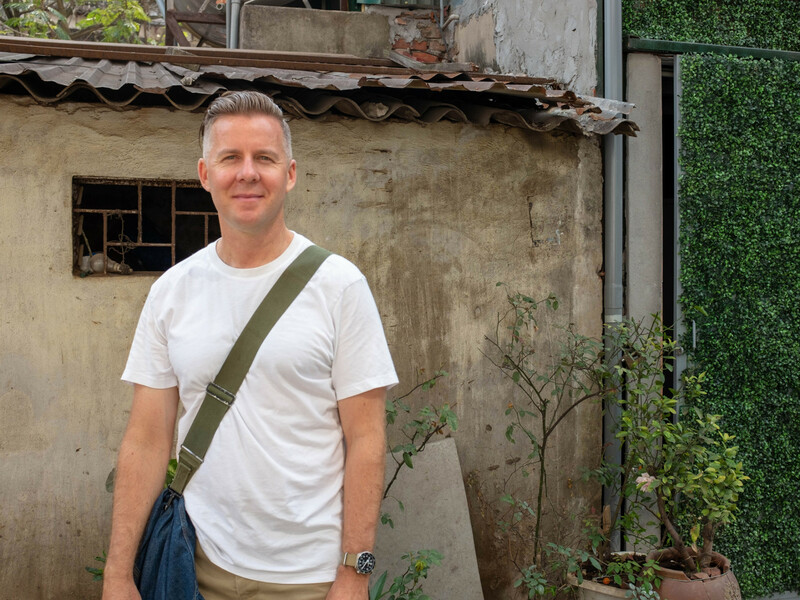 Wandering around Hanoi was a great experience as we explored different streets, each selling a unique item, from tailored clothes to ceramics to motorcycle seats. The serendipity of walking without a specific purpose means coming across unexpected moments of delight. 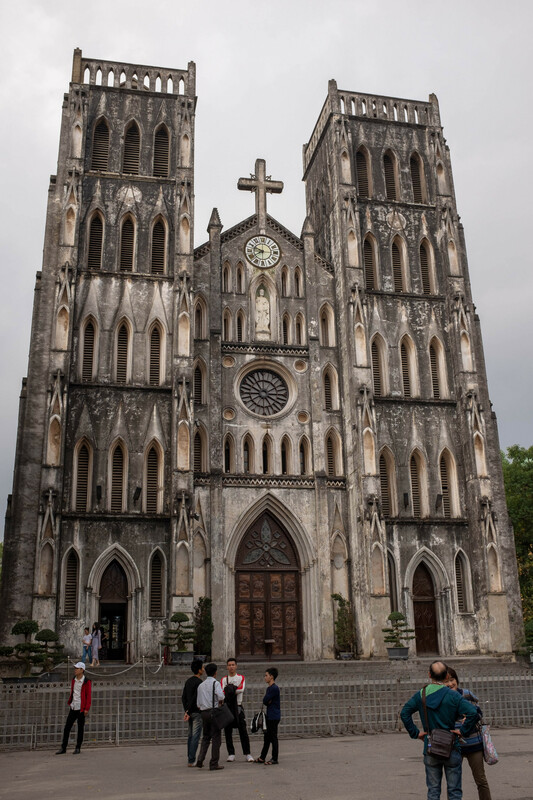 First, it was the St. Joseph’s Cathedral, a late 19th-century Gothic Revival church on Nha Chung Street. This is an impressive building, slightly reminiscent of Notre Dame, that serves the nearly four million Catholics in Vietnam. 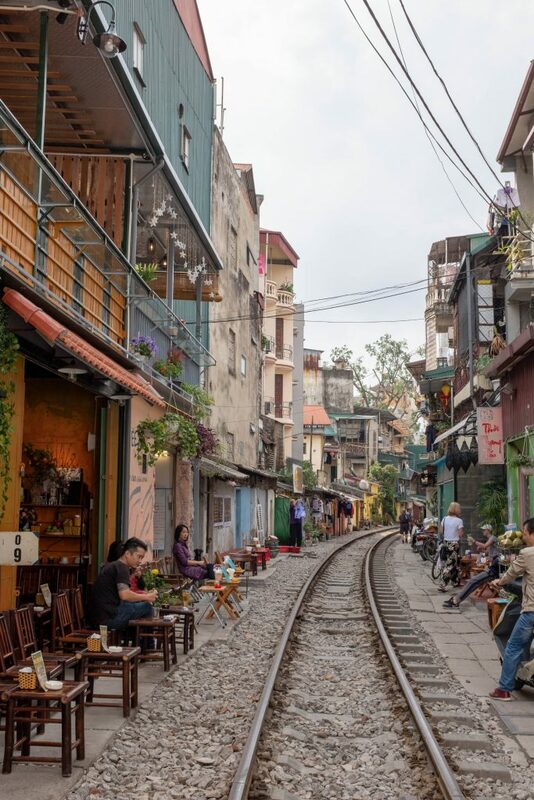 Next, we stumbled upon Hanoi’s infamous Train Street where trains run in between the houses, mere feet from people’s everyday lives. This was a superb find and something most travellers will include in their visit. 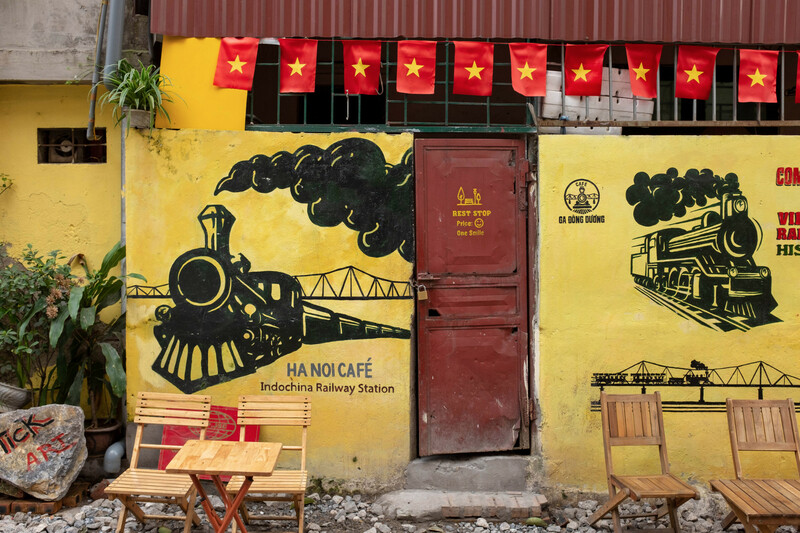 The area has a great feeling with rail-side cafes selling tea and Vietnamese coffee side-by-side with people living out their lives in close proximity to the trains. 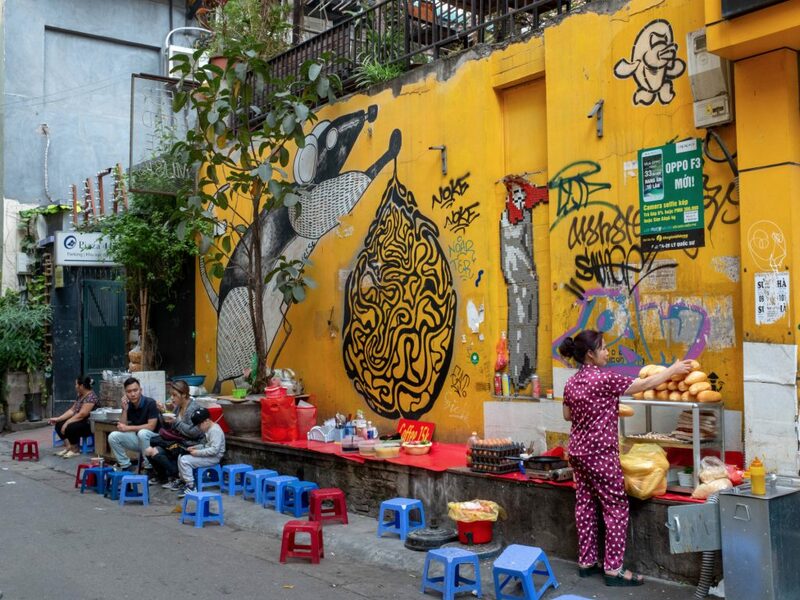 Murals enliven the walls with traders selling their wares in this most precarious of locations. It was very atmospheric. 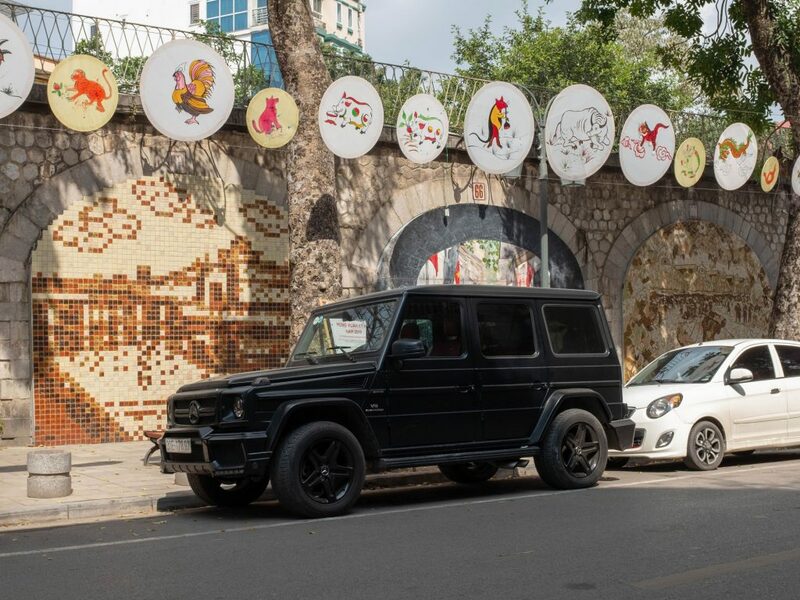 Walking towards the market, we stopped to take photos along the way, noting a pimped gold and silver Range Rover. The driver was extravagantly dressed in a shiny silver suit and hat. He was quite extraordinary to look at. At the markets, we ate chicken noodle soup outside, frankly hoping for the best as far as hygiene is concerned. 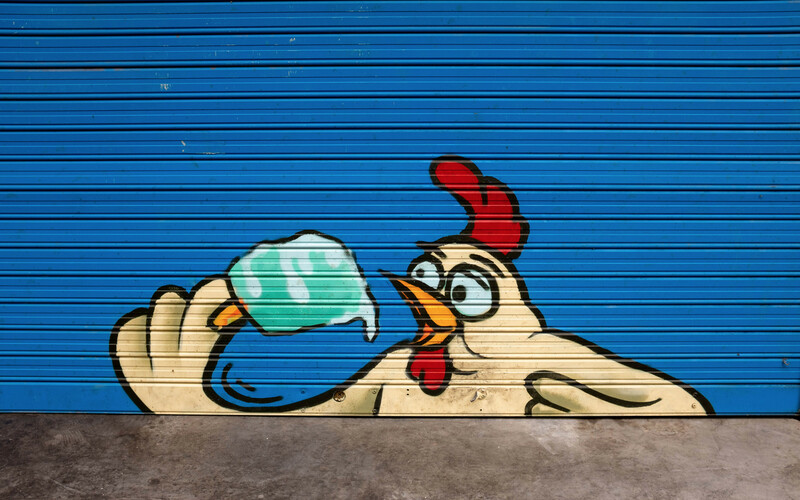 While cleanliness was not an issue, the chicken was tough and put some of the crew off meat for the next few days. 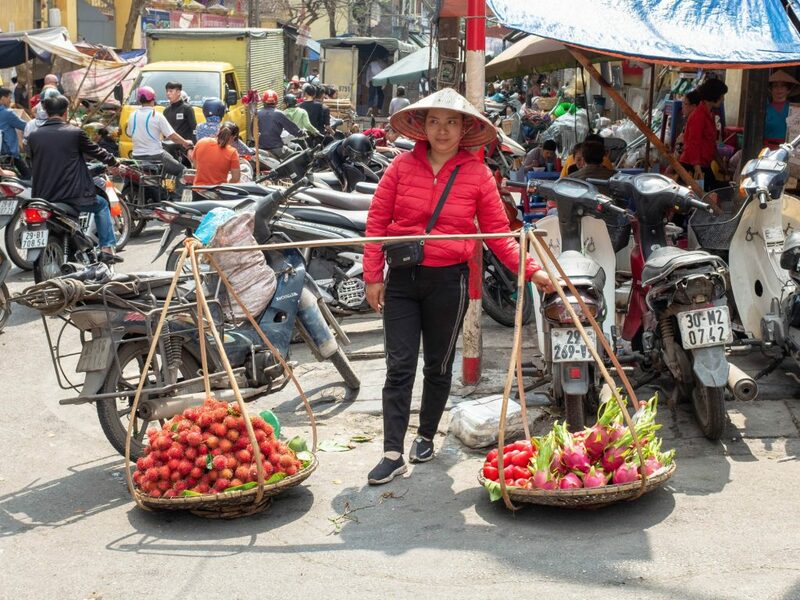 Outside the market, I took this photo of a young woman selling fruit. She stood out from the crowd with her red jacket and traditional hat, typifying a certain type of trading that goes on at the street level. On the streets and in the eating houses, a roast dog appears on the menu and sometimes is roasted directly on the footpath.  This image affected some of the crew. 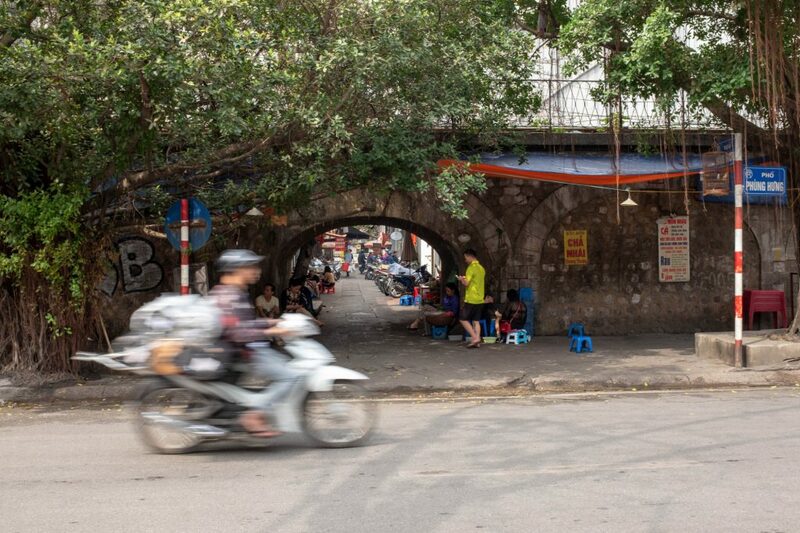 While intellectually there is not much difference between eating dog than lobster or chicken, somehow roast dog on the street felt wrong; and it seems as though the Vietnamese government feels this way too, proposing to stamp out the roast dog as it’s negatively impacting tourism. On the way to Legend Beer, a bar one floor up from a busy intersection in the Old Quarter, we walk past glasses street. I spotted an unusual blue round pair, something like what artist David Hockney would wear. Oddly, these seemed to suit me; so I bought them too, along with a Tintin in Hanoi notebook from a shop around the corner. 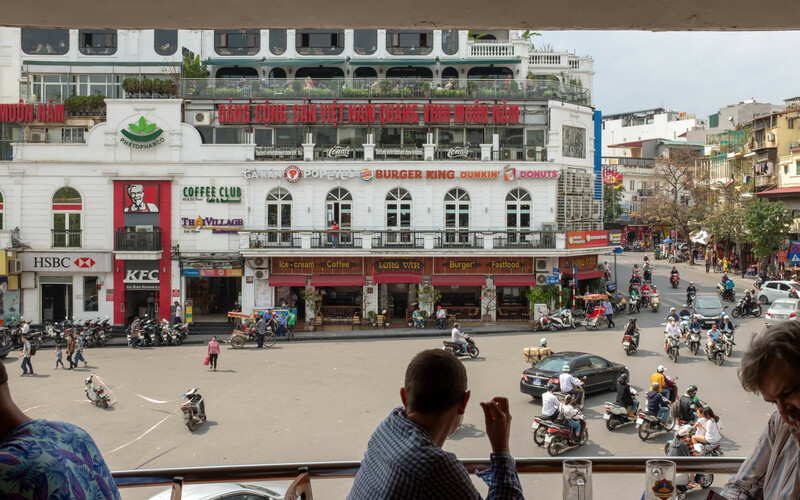 The view from Legend Beer over the thronging traffic illustrates one of the things I like about the people of Hanoi. 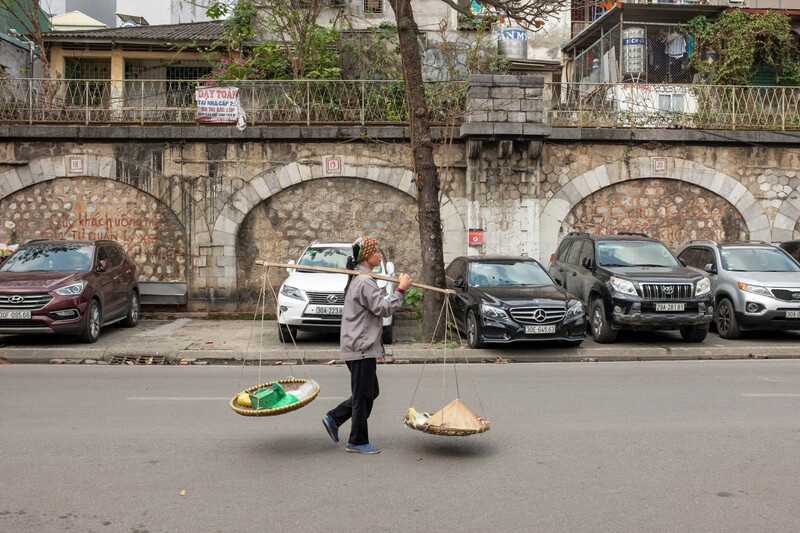 It is the sensible way the locals get things done, living life on the street, with pedestrians, cars and scooters sharing the roads in a kind of forced harmony. Heading back to the hotel for a rest before dinner, I spotted So Green, a cold-pressed juice bar. Smartly designed, it serves healthy drinks of fruit, vegetables and seeds. It was so tasty and reviving, I went back many times while in Hanoi. Meeting the crew for pre-dinner drinks, we sat outside Durty Bird, a smart chicken burger restaurant as dusk settled upon the city. 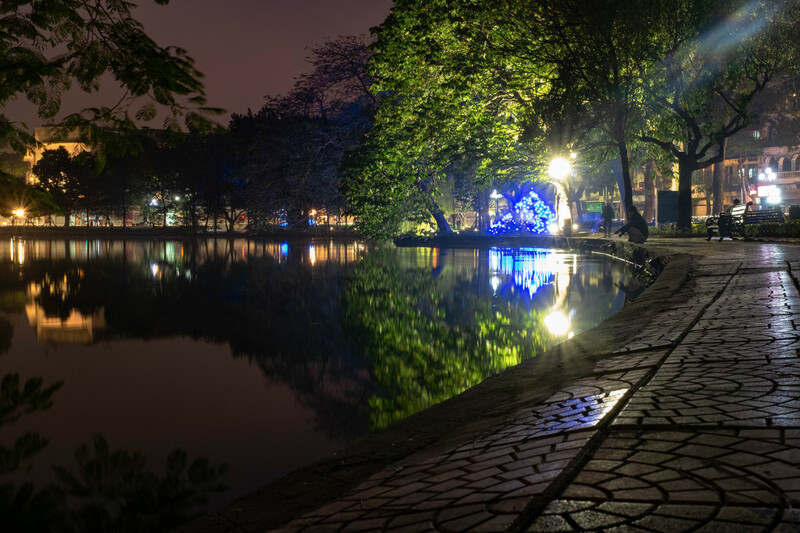 Hanoi indeed becomes more beautiful after dark as the lights go on and the smog haze is replaced with brilliantly lit buildings. 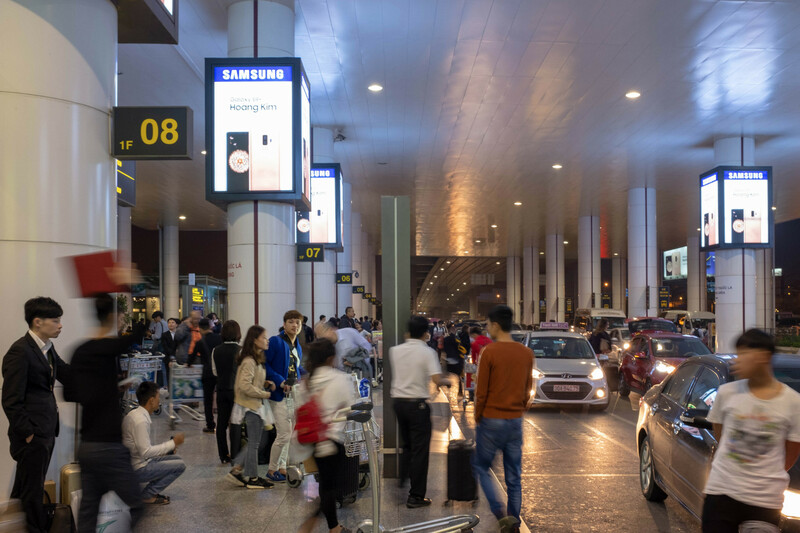 If anything, it is even busier out on the streets after dark. 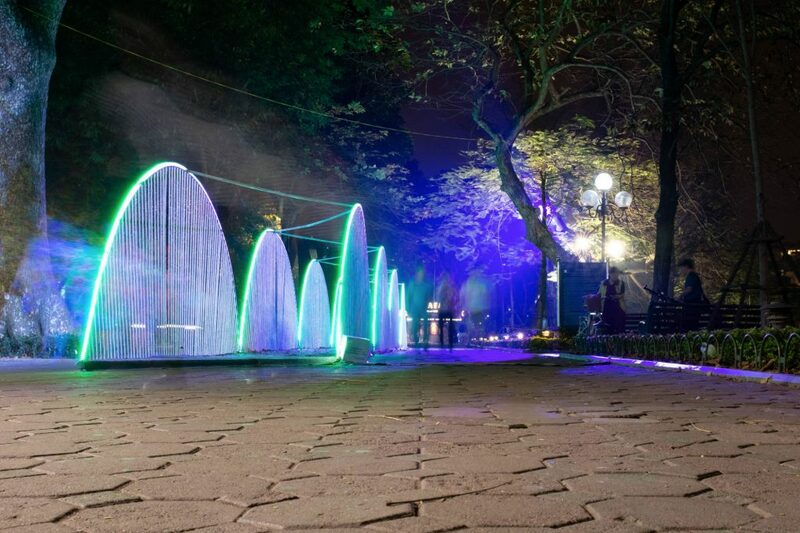 On a recommendation, we took a taxi to Tay Ho, an upscale area with apartment buildings and bars lining West Lake. This proved to be less successful as we wandered for over an hour attempting to locate a particular bar. Settling into 88 Lounge for snacks and drinks, it was a smart establishment with good cocktails. 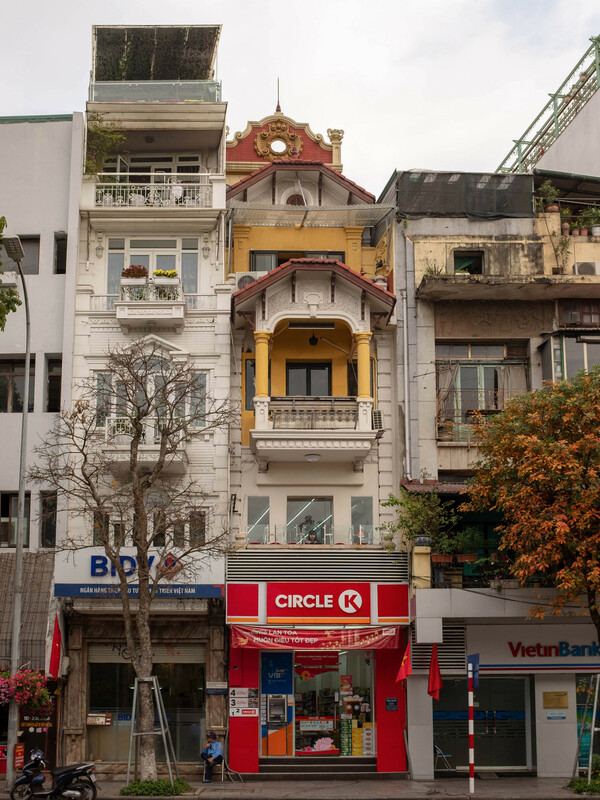 As we returned to the Old Quarter by taxi—four guys squeezed into the back seat of a rather small Toyota—I reflected on our first day in Hanoi. There is an undeniable energy to the city, and I was thrilled to be here. 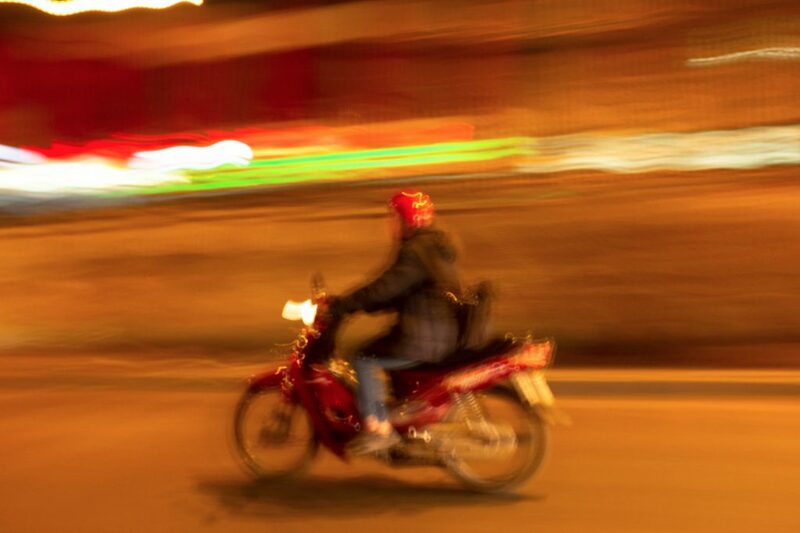 Taking blurry photos of scooters in the traffic from the moving taxi window, I looked forward to the following days as we made our way into the mountains for seven days of motorcycle riding. 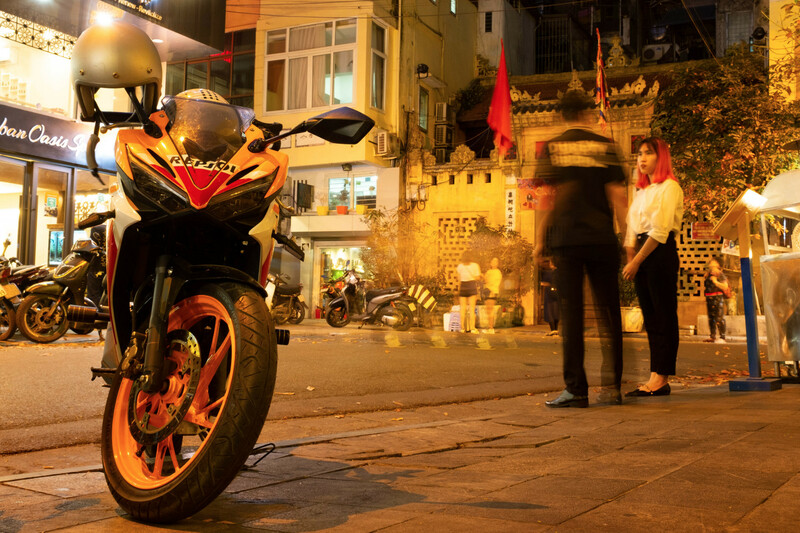 Awaking before dawn, walked the streets to see Hanoi before the workday begins. 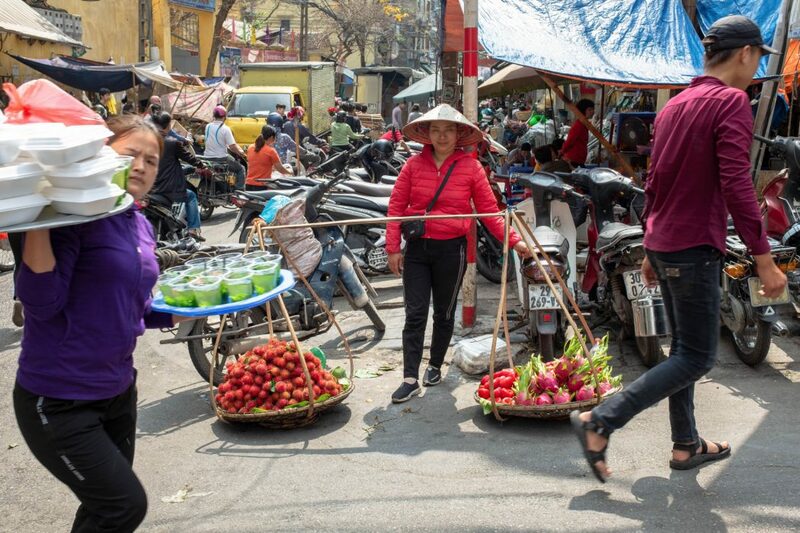 There are fruit and vegetable stalls laid right out on the road as traders bring their products in from the country with butchering done directly on the street. Around the lake, there are middle-aged and senior citizens doing aerobics, young men lifting weights and all age groups dancing to what sounds like Russian pop music. 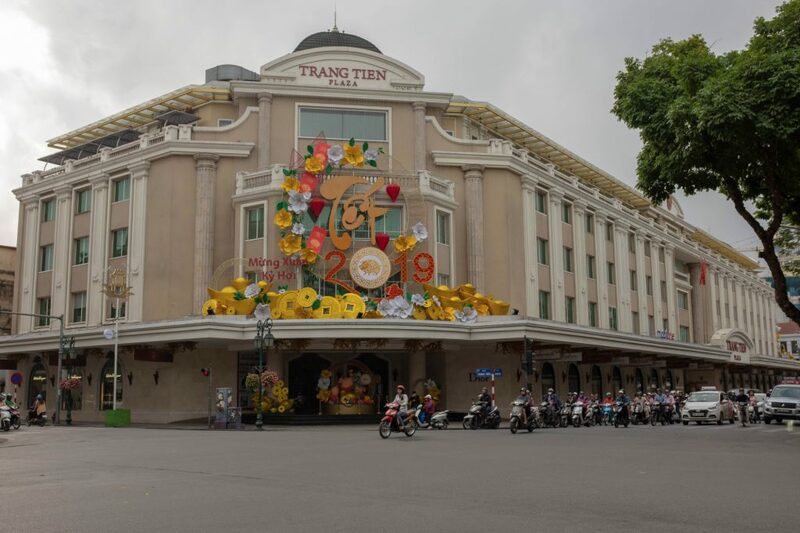 This is a nice time in Hanoi as groups of friends happily meet for their daily exercise and gossip. Dennis Lindsay is the Publisher of The Better Living Index and Co-Founder of The Propagation Unit.